We are pleased to inform you that the 14th International Workshop on Higher education Reform will be held on September 26-28, 2017. ※The conference fee includes Welcome Reception (26 September) and coffee breaks. ※Participation in the Conference dinner (27 September) is optional. ※Please note that payment of participation fee (including conference dinner fee) can not be refunded in any case. Venue: Reception Hall at Faculty Club, Hiroshima University, etc. 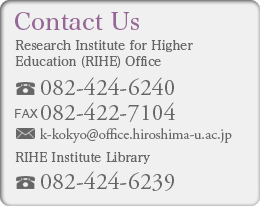 *Some of the highest quality papers presented at the HER2017 will be published in a special issue of Higher Education Forum (http://rihejoho.hiroshima-u.ac.jp/en/publications_en/hef_en/), which is in the process of registering with Elsevier’s Scopus. The special issue of Higher Education Forum for HER2017 is scheduled to be published in March 2019.